Pinterest is a cross between twitter, a bookmarking site and a global game of show & tell. 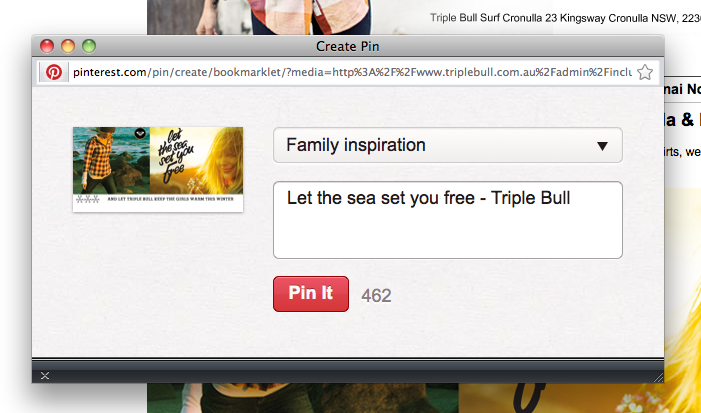 Users find interesting photos online and 'pin' them to 'boards' (or save them into categories). Similar to Twitter, you can select to 'follow' your friends but Pinterest also determines other people that post similar content and add them to your feed as well. The end result is a constant stream of photos of all different topics and styles. Clicking on the photo takes you back to the website it came from, so you may be checking out a million dollar kitchen followed by a great rainbow layer cake recipe or weekend craft ideas with the kids. For the most part, the photos are high quality, and even if you're just into looking at great inspiring photos, you'll get a lot out of the site without ever pinning your own images. It may seem a little strange in concept, but it's very simple to work out, and before you know it, you've spent 3 hours looking through all of the great content. Pinterest is NOT meant to compete with the likes of Facebook or Twitter, and really doesn't provide a similar function. Its main function seems to be providing an unlimited resource of things that people like; including (but not limited to) cooking, clothes, art, nostalgia, flowers, craft, cocktails, aspirational quotes, unbelievable home renovation, as well as a slew innovative products and portfolio pieces. Pinterest started in early 2010, and although reaching 10,000 members within 9 months, it wasn't until an article in Time Magazine (Aug 2011) that it started to gain a massive following. By December 2011 they were averaging 11 million visits per week, and by January 2012 there were almost 12 million unique users, making it the fastest site in history to break the 10 million user mark, and as by March it was officially the 3rd largest social media network in the US. It has been reported that as many as 85% of users are female, and altough the averages are slowly coming back towards even, the user base is still heavily weighted by women which does prove to be a great targeted demographic for marketing. Although the official rules are relatively unrestricted, they do have a Pin Etiquette page which outlines their requested usage. This includes things like being respectful, crediting your sources & user responsibility for reporting questionable content. It's important to note that all content that you pin is public, so anybody can see your activity - whether they're a member or not. There are no private boards, so it's intended to be a truly social and open network - like twitter. There is ongoing discussion around the tone of the artwork being added by businesses, whether it needs to have some level of artistic merit, or if all is fair game. As noted, there's no rules that touch on the tone of the content (beyond inappropriate content), but I think you'll find more success if you produce artwork somewhere in the middle. Content that has more of an artistic or high quality photographic element are more likely to be liked or re-pinned. The genius thing that Pinterest have done is to integrate each action with your favorite social network (Facebook or Twitter). Whenever you add something new, like something of someone else or re-pin content, the action is saved to your news feed. This means that the things you 'like' are being exposed to your entire social group (and visa versa), as WELL as random people that like similar things. The way these things generally trend, within year or so, Australia will be well and truly on the Pinterest bandwagon. You will want to be on early to be familiar with how it works, but it's more important to be active. Just like most social networks, content exposure is highest at the time of posting (or pinning in this case). It's a bit of a chicken or the egg scenario, but why not have a dominant presence ahead of your competitors. In terms of content suggestions for your business, there is an easy ways to integrate with your website. If you set up a specific image that represents your business you can add a 'pin it' button to your site. Users clicking this button and they will see a popup with the image you have made along with a pre-written message. This can be great to add some viral component to a giveaway or promotion or just something new you want to get some wide exposure on. Here's a few companies that have put a lot of effort into their boards and their Pinterest presence. Pinterest is a free network, but is limited access in that if you want to just go to the site and sign up, there's a 3-5 day wait for your account to be approved. The quickest way to get instant membership is to be invited by an existing member. This ensures that you start with at least 1 friend, and the Pinterest network stays communal in nature. If you would like an invitation, just give us a call or shoot us an email, and we will send over an invite. Feel free to chat to us about how Pinterest could be a benefit to your business, and let us know how you're using it in a new and interesting way.